Both magnificent in their size and ability to live for centuries, redwood and sequoia trees comprise some of northern California's most majestic forests and national park acreages. These two trees are very close relatives, but physical characteristics and their natural growing ranges differ. Confusion is common, and the scientific names used may lead people to incorrectly believe these two tree species are one and the same. Both trees are members of the same plant family, Taxodiaceae, or bald cypress family. However, they are each categorized into a separate group, or genus: the California redwood or coastal redwood (Sequoia sempervirens) and the giant sequoia or giant redwood (Sequoiadendron giganteum). Although both species are found in California, coastal redwood is found growing in the moist coastal forests of western California and southwestern-most Oregon. The giant sequoia grows naturally in California's Sierra Nevada Mountain range farther east. Coastal redwood (Sequoia sempervirens) grows to very tall heights, upwards of 300 to 360 feet, with branches that create a canopy width of 20 to 28 feet. More commonly the coastal redwood is seen at a more youthful height of 70 to 100 feet. The giant sequoia (Sequoiadendron giganteum) is much shorter, but with a much stouter, massive trunk. It reaches heights of 80 to 260 feet and a canopy width of 22 to 30 feet. The giant sequoia is extremely long-lived. Scientists in the 19th and 20th centuries had dated large specimens to be 3,000 and 3,300 years of age. The coastal redwood also potentially reaches ancient status, but dating of this species finds a lifespan of 2,000 to 2,200 years, as listed by "The Gymnosperm Database." Coastal redwood foliage has hard, linear, sharply pointed needles on its branches, held outward in two ranks or angles. The needle undersides are silvery white. In contrast, the needles of the giant sequoia are arranged all around the twigs and are individually shaped like awls. They are grayish green. The cones on these two trees persist and ripen differently, too. Coastal redwood's rounded cones ripen in autumn after first forming in spring. Giant sequoia's oval cones take two years to fully mature, and then persist on the branches for at least six months longer. 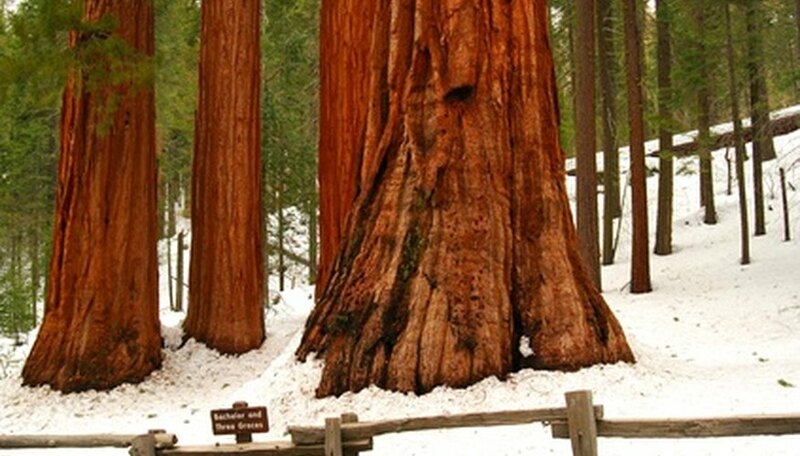 The hard bark of the giant sequoia is much thicker than that of the coastal redwood; both are reddish brown. This fissured bark protects the living wood of the giant sequoia from forest fires that naturally occurs in this forest ecosystem. Giant sequoia grows in a forest that is less humid and has lesser annual rainfal than the cooler, wetter forests inhabited by the coastal redwood. Thus, coastal redwood's bark is not nearly as thick and is much softer in density.